Like many women, I’ve had a box that has moved with me many times over the last 25 years. Even as I write that I can’t believe the contents have been with me for so long. 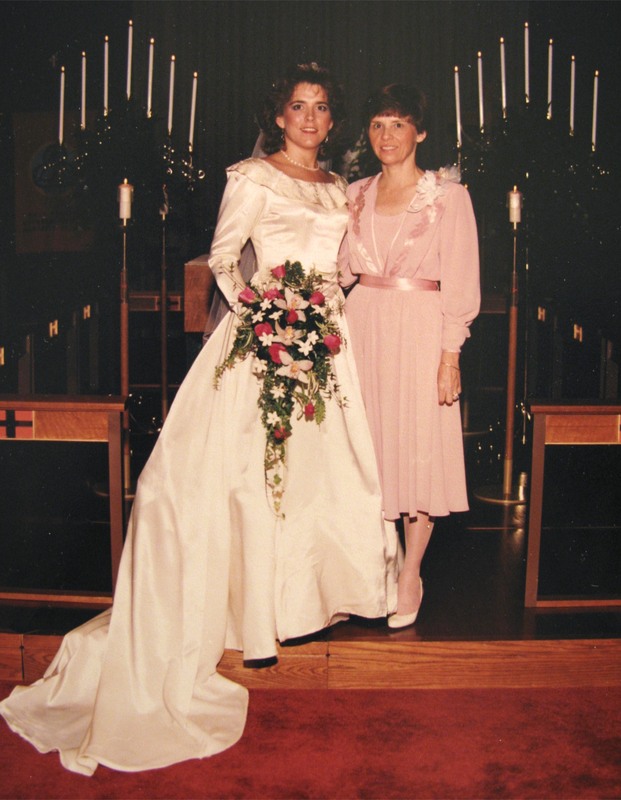 In 1986, I bought a vintage wedding dress from an antique store in Athens, where I was in the middle of my third year at the University of Georgia. I’m not sure why I longed for a wedding dress from another era, but when the shop owner carefully helped me into the dress she’d brought out from a safe place in the back of her shop, I felt like I had stepped into a black and white movie. She guessed the age of the dress at 1940s, and I liked that it had a history before me. I wondered if the bride who wore it originally, felt as elegant in the candlelight colored satin as I did and I loved that it had a rich weightiness to it that modern-day dresses did not. The delicate glass beadwork that circled the neckline added to the simplicity of the dress, making it seem like something from Walt Disney’s, Snow White. While I looked much larger than my petite mother, Judy, I was an American size 9/10 (Probably more 10 than 9) when I wore the dress which was long enough to allow my 5’5″ self to wear heels with it. I spent much of this weekend recovering from a virus of some kind and during moments when I felt well enough, I read up on Etsy and Ebay sites for directions on how to sell items online. After my daughter reconfirmed that she did not want my professionally cleaned and stored dress, I decided 25 years was long enough to keep it locked away. I’m putting together a sale page to move a few things on to a new home and hopefully, this will be one of the first items to go. If you know a bride who is looking for a dress that is true vintage and not a reproduction, something that will be a unique look that she won’t find variations of in current Bridal magazines and will make her feel special without taking too much of her wedding budget, please send her my way for details. This entry was posted in Choices, Life in General, Memories, Money, One Word - Completion and tagged 1940s Vintage Wedding Dresses, Ebay, Elizabeth Harper, Esty, Gifts Of The Journey, Glass Beadwork, Judy Schrader, Snow White Wedding Day, Vintage Satin Wedding Dress, Vintage Wedding Dresses. Bookmark the permalink. Beautiful dress! And so full of memories I’m sure. Thanks for sharing…..
Oh, don’t sell it! It is beautiful and one-of-a-kind. Even though your daughter doesn’t want to wear it, maybe you will have a granddaughter one day that wants to wear it (maybe even John’s granddaughter). I think you will regret it. If it is in a box like mine, it can’t take up that much room. If you don’t have closet space for it, put it under a bed. I really really think you shouldn’t sell it!! And just to put in my two cents. I say sell it if ya wanna. Oh, how lovely you look in that dress! I think it’s very much like a snow white dress, you are right….and I love that photo of you sitting with your dress all billowed out…your hands form a heart. That’s so lovely. Good luck with your sale….I think you will miss it, but maybe it will bring some other bride the same joy and sense of nostalgia that it did you. Emily Jane ~ Thanks for your kind comment. I look at it now and think, ” Good grief I have a ton of makeup on and could someone have said those eyebrows needed weeding! ” It’s funny to look back on 80s hair and makeup now. I remember that photo being taken more clearly than most of the others that day mostly because it evolved on the spur of the moment and was about as creative as my poor photographer was able to pull off. Here’s what happened … I was waiting to go down the aisle and afraid to sit because I did not want to wrinkle my dress so I knelt with my dress sort of bunched around me. My photographer (An old school trained, posey, posey, sort) decided he liked the look and had his assistant spread the dress out like you see it. As for the heart, honestly I always thought of it as just holding my hands so that my fingers would look more delicate and was not even aware that they were making a heart. I think I saw it for the first time this morning myself. I don’t think people were actively doing that (making hearts with their hands) in 1986 and my photographer never said anything about it. As always, you are lovely!! Oh, and the dress is gorgeous too! Maybe it is my age, I probably would have said keep the dress 10 years ago, but now I say sell it. The older I get the more I wonder why I hang on to material things. There is definitely freedom in releasing. And you have the beautiful photos. I would have said keep it a month ago…but after packing up my life to move to London…I am now of the mind that someone else needs an opportunity to love it. I have given away so much stuff lately — and you have the photos which capture the memory. That is perfect. I will send out a wish right now, that someone sees this and wants to begin their journey with your beautiful dress! I know you will send it to them with lots of love for their incredible day and they will pass it along to the next woman who will feel that so many women have been a part of their journey as well. What a gorgeous gown!! Nothing like beautiful vintage couturier. And – what a great idea to try to sell it. Why not?? Well, you got the Disney part right but actually it is much more the style of Sleeping Beauty! Scott is right it is more sleeping beauty. It is beautiful and you are a picture perfect bride in it. Such loveliness. But if you and your daughter are of one accord about the sale You should do what you want. Not long ago my mom offered me the wedding ring/engagement set she got from my dad (they had a difficult divorce in ’82 after 13 rocky years) and I told her (as did my sister) that I had no personal attachment to it (tho’ it was lovely). That it was hers to keep, melt down, or give. Now when my grandma passed away long ago I claimed her old enamel coated rose painted small metal bowl she kept by her bedside table for jewelry and change…it was a precious everyday item of “her” for me, and it now sits on my bedside table. ONly we can best judge those items that we hold dear. It is a beautiful dress FULL of wonderful memories! — Keep it your daughters daughter – to know the meaning of happiness and love. I am looking for a 40s wedding dress to wear to celebrate my 40 years with my guy. We want to take our portrait in vintage clothes. Please let me know if you decide to sell. It may be the one! Thank you!